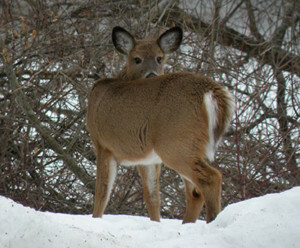 How are whitetails weathering winter? I’d be lying if I said I don’t enjoy winter. In fact, I’ve come to love it in certain ways. As the extreme cold that followed a pair recent storms bore down on the Lake George region where I call home, I smiled when thinking about the lake buttoning up so I can get to my favorite ice fishing spots. I have a big yard and a long driveway. In the summer I spend anywhere from two to four hours mowing my lawn; often in consecutive weeks. I can tell you that I spend a lot less time plowing snow. And, I’ll take being cold over being hot any day. But when I look out the window at Old Man Winter, the one thought that always crosses my mind is the current state and health of the deer herd – not only where I live and hunt, but throughout the North Country, including the Adirondack region, or anywhere for that matter. Winter came early to the Adirondacks this season. While Southern Zone deer hunters were enjoying a comfortable opening day, the Adirondacks were recovering from a huge snowstorm that dumped a foot of snow on average in the region. Some places got much more. I was hunting that weekend in the northern Adirondacks near what I’ll call the Route 3 corridor. We awoke to 18 inches of snow that fell overnight on top of six inches already on the ground. Although it was only mid-November, that storm, and another that hit the area right after Thanksgiving, all but ended the season for many hunters. It didn’t do much for the deer, either. Those areas have remained in the snow since then, which is going on three months now. So the question is, how healthy were the deer at the time that storm hit, when winter began, albeit a month early? Last fall was not a great year in terms of mast crops. There were few, if any, acorns where oak trees reside. Ditto for the beechnut crop. Throughout the season, deer were surviving on browse, ferns and whatever they could find. As winter wears on we have to wonder how their fat reserves will hold up. These areas, and the deer that reside in them, would certainly benefit from an early spring. Other areas didn’t have it so bad. Where I live and hunt in the southeastern Adirondacks, we got plenty of snow from those late hunting season storms. But by Christmas, it was gone. From a hunting standpoint, I would’ve taken the weather we had in December over that of November any day. Until mid-January, when we got a blockbuster storm, it had been pretty quiet around here and we had many areas that had bare ground. I’m not too worried about those deer. Getting back to the interior of the Adirondacks, in recent years, the muzzleloading seasons in the northern and western parts of the region have been buck-only, mainly due to the severity of recent winters. It will be interesting to hear what our wildlife biologists will have to say about the condition of the deer herd after this winter. And, what impact it could have on the 2019 fall hunting seasons.